RFinder - The World Wide Repeater Directory now has Jamming Reports! 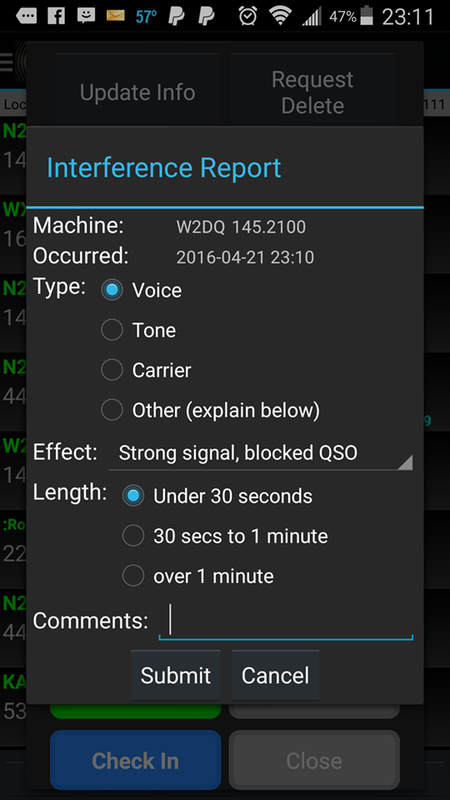 Home App - Mobile RFinder – The World Wide Repeater Directory now has Jamming Reports! RFinder now includes the ability to make jamming reports. This is already available in RFinder Android and should be available on iOS devices by Dayton. This ability is available worldwide. RFinder is the World Wide Repeater Directory and includes over 60,000 repeaters worldwide in over 170 countries. RFinder is integrated directly with EchoLink on both Android and iPhone and provides the ability to share repeater checkins on Facebook, Twitter and APRS. RFinder is integrated with RT Systems and CHIRP radio programmers and has a routing feature at http://routes.rfinder.net where you can find repeaters over a route worldwide. Video demos of RFinder can be found at http://youtube.rfinder.net . – RFinder is the Official Repeater Directory of Radio Amateurs Canada… Canadian Amateurs who subscribe contribute to RAC. – RFinder is the Official Repeater Directory App of Radio Society of Great Britain… UK Amateurs who subscribe contribute to RSGB. – RFinder is the Official Repeater Directory of Amateur Radio Society Italia… IT Amateurs who subscribe contribute to ARS Italia. – RFinder is the Official Repeater Directory of Federación Mexicana de Radioexperimentadores… MX Radioaficionados who subscribe contribute to FMRE. – RFinder is the Official Repeater Directory of Deutscher Amateur Radio Club…DE Amateurs who subscribe contribute to DARC DE. – RFinder isEl directorio de repetidor con la base de datos oficial de Unión de Radioaficionados Españoles…ES Amateurs who subscribe contribute to URE ES. – RFinder is the Official Repeater Directory of L’association Réseau des Émetteurs Français…FR Amateurs who subscribe contribute to REF FR. – RFinder is the Online Repeater Directory of American Radio Relay League…US Amateurs who subscribe contribute to ARRL US. – RFinder is the Official Repeater Directory of Cayman Amateur Radio Society…KY Amateurs who subscribe contribute to CARS KY.